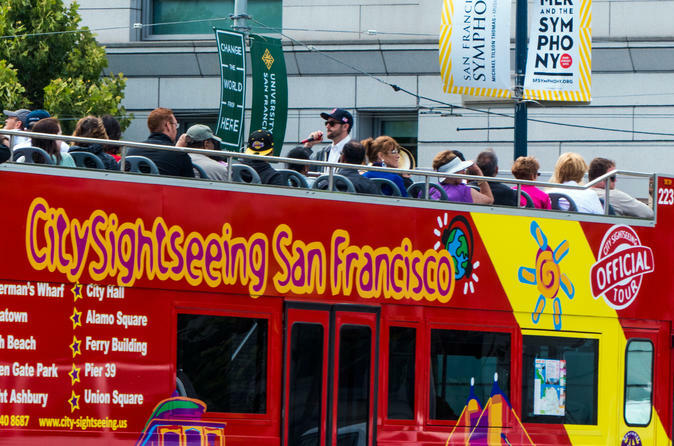 See San Francisco's most exciting attractions aboard a Double-Decker bus with one ticket. Discover downtown San Francisco, the Golden Gate Bridge, Golden Gate Park and other big-name attractions, all at your own pace with this 48-hour City Sightseeing pass. Simply hop on and off the bus at any of the designated stops. Choose from multiple routes with the 48-hour pass, which also includes a Night Tour so you can enjoy evening panoramic views of the Bay. This is a flexible, fun, and family-friendly way to make the most of your time in the city. In addition visit San Francisco Dungeon, admission ticket is included with this tour. San Francisco offers so much to see in its 49-square miles: top museums, fantastic restaurants, theater performances, one-of-a-kind architecture, and panoramic views of San Francisco Bay. The best way to see your favorite sights at your own speed is with a hop-on hop-off bus tour. Enjoy unlimited travel Official City Route, Sausalito Route, Parks and Beach Route and a Night Tour with this 48-hour pass, which also includes a free 1-hour bike rental, a VIP pass for attraction discounts and 2 Walking tours. City Sightseeing tours depart from Fisherman's Wharf, but you can join at any stop along the route. Learn fun facts about San Francisco on the full loop, or hop off to venture out on your own. The range of tour options give a diverse sampling of San Francisco's sights and neighborhoods. The Official City Route takes you to all of the main sights of San Francisco, including Golden Gate Bridge, Golden Gate Park, Chinatown, Victorian houses, famous Haight-Ashbury district, Fisherman's Wharf , Financial District, and the Ferry Building, where you can try excellent local seafood. The Sausalito Route offers sweeping views of the water as well as a chance to tour the streets in the charming town of Sausalito. The Parks & Beach Route takes you through one of the largest urban parks in the world to stunning Ocean Beach, Lands End hiking trails and the historic ruins of the Sutro Baths. The Night Tour is the perfect way to see the sparkling sights of the Bay in the evening, giving you fantastic views of downtown San Francisco from the top of Nob Hill, Chinatown, North Beach, and the Embarcadero. Additionally, you will receive admission to the San Francisco Dungeon, an attraction that takes you back 2 centuries into San Francisco's spooky past. Special Offer - Book this tour and save 9% compared to booking each attraction separately! - Book Now!